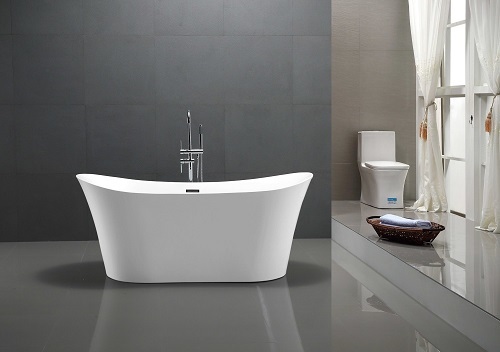 2019 is shaping up to be a big year for design comebacks, and one of the biggest ones is honestly one of my favorites: the freestanding bathtub. Now, there’s been a lot of back-and-forth in the design world over the last few years about what constitutes a “must have” for a luxury bathroom remodel. Just a few years ago, big tubs were a big no-no, and the huge showers that replaced them are already on their way out. So take this trend advice with a grain of personal preference. But if you ask me, this year’s hype for “destination bathtubs” is a good answer to the unspoken question: how to get a bathtub big enough to relax in, but small enough that you can actually use it. For a long time, whirlpool bathtubs were considered the gold star of luxury in bathroom design, and the peak of decadent bathing and R&R. But the problem with whirlpool tubs is that they’re big, which means they take forever to fill, and without the right hardware are as likely as not to end up with you sitting in a whole lot of lukewarm water. They’re also expensive, both because of the hardware needed to run them and the installation needed to get them set up. Freestanding bathtubs fix all these problems in one fell swoop: they’re less expensive, require almost no setup, and are designed to give you the same fully-submerged experience with a much lower water capacity. 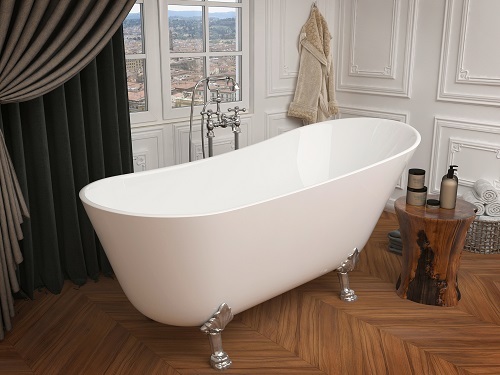 One of my favorite things about freestanding bathtubs is that they’re designed to be beautiful and sculptural all on their own. While many traditional whirlpool tubs require tub mounts for installation (which can be quite beautiful, but also very expensive! 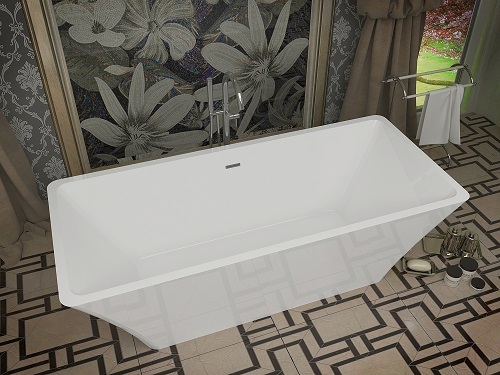 ), freestanding tubs are ready to go as-is, and let you get a look that’s shapely and sculptural in a way you just can’t pull off with a more traditional installation. 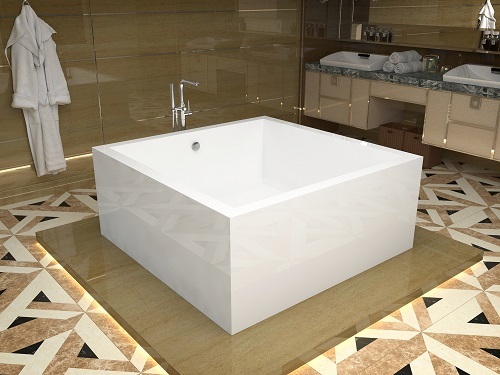 Many freestanding tubs are inspired by classic clawfoot tubs, especially elegant slipper tubs, but many more have elegant modern designs that can easily act as the centerpiece of your space. So What Is A “Destination Bathtub” Anyway? If you keep an eye on interior design trends, you’ll probably see the phrase “destination bathtub” flying around a lot this year. Through all the commentary I’ve seen, I take it to mean two things. First, the idea of “destination” is part of a larger trend of building parts of your home you can be comfortable in. That means having a tub that’s equipped to help you get away from it all – whether that means having a nice sound system, a tiny table for bath oils, a comfortable dressing chair, a beautiful bathtub chandelier, or (one of this year’s most popular choices) a nearby fireplace or fire feature to double down on that warm, relaxing experience. Second, the “destination” is a little more literal – namely having a tub that’s actually set apart from the rest of your bathroom. There are a couple ways of pulling this off, but one of the big suggestions I’ve been seeing so far is sacrificing a closet in an adjacent bedroom or hallway to create a tub niche. If you’re able to sacrifice the storage, this is a really great look, since it not only gives you space to put a tub, but also a way to frame it really beautifully. A floor-to-ceiling “backsplash” or accent wall behind your tub can highlight the silhouette of your tub, emphasizing its shape and helping it stand out, even if it’s slightly removed from the rest of your bathroom. 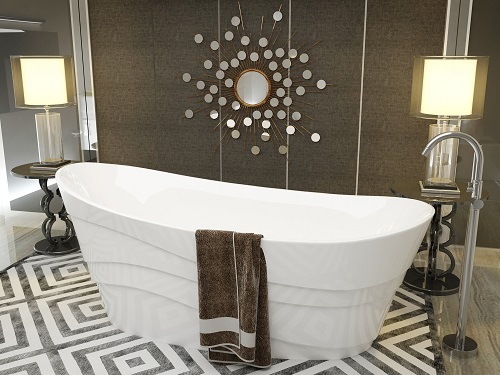 If you’re all-in for a major bathroom renovation, another big trend on the rise is to have bathtubs that are really truly freestanding – that is, not just the style of the tub, but also the placement. While it certainly takes a bit more work (especially in terms of plumbing), lately I’m seeing a lot of homeowners choose to put their bathtub smack dab in the middle of their bathroom, or otherwise offset from the wall, up on a pedestal, and more of a deliberate focal point. Not only does this give your bathroom an open, decadent, spa-like feel, but it also gives you room to spread out and relax without feeling crowded into a corner while you bathe. Another oldie-but-goodie that’s seeing a new surge in popularity is the classic garden tub – aka, a bathtub placed up against a window with a view. This is one of my all-time favorite options for a master bathroom; a well-placed window lets in lots of light and gives you a nice, soothing view of nature while you bathe…without giving anyone a peek inside while you’re enjoying a good soak. Unlike tub niches, garden tubs aren’t easy to set up if you don’t already have a window, but are easily one of the best ways to bring a soothing touch of nature into your space. If you’re a big fan of baths, but never find the time to fill up a big whirlpool, it might be time to re-imagine what it means to take a good, long soak. 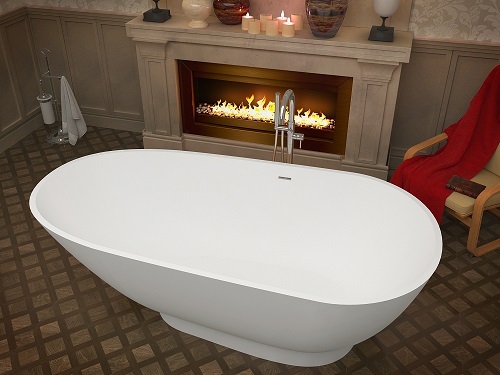 Freestanding bathtubs are a stylish, affordable alternative to expensive jetted tubs, and might just be the little luxury touch you’ve been longing for. This entry was posted in Bathroom, Bathtubs, Decorating Ideas and Tips, Latest Trends and tagged 2019 bathroom trends, bathroom trends, bathtub trends, destination bathtubs, freestanding bathtubs, Master Bathroom.